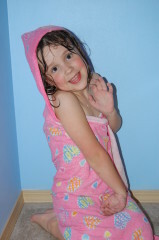 Here’s a quick one I learned by reading on-line tutorials: the hooded towel. This one is so easy that all you need to make two hooded towels are two regular bath towels and one hand towel. I can literally make these in 5 minutes — I made two right before taking the kids up for a bath tonight! To get started, cut your hand towel in half, across the shorter width. Once you’ve done that, you’re already halfway done making two hoods. For each hooded towel, you lay your towel out and find the center on the long side. You pin the finished edge of one of your half hand towels (NOT the edge where you cut) to the center of the long end of the towel, overlapping the towel by about 1/2″. 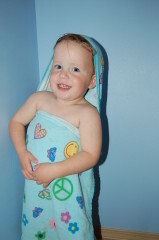 Once you’ve pinned the hand towel to the bath towel, you just sew them together across the bottom of the hand towel. I like to use a zigzag stitch. You can also add trim to the hood (the one below was trimmed with bias tape, and I have another I trimmed with ric-rac), or you can add an appliqué to the towel or whatever else you can think of to personalize it. The possibilities are endless! Sommer — these are so cute! What a great idea. If I could figure out how to use my sewing machine, I would be set! Yep, I’m so doing this this weekend! 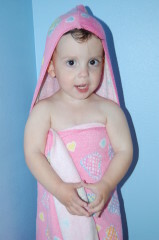 Our kids have grown out of all the baby hooded towels we have. Fun! I can’t wait to see what you come up with. :) I need to get out and get some nice plain towels so I can do the kids’ initials on them or something for the beach and pool this summer.